I'll dig through this section of the forum but thought I ask for tips. We have a few day's coming up where we might be in the Adirondacs or Vermont. Outside of our sorta nearby shield zone. Rather than backcountry we are looking for some nice scenery on state parks, car camp or day paddles. If anyone has links or suggestions we'd appreciate a suggestion or two. 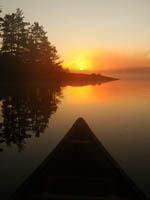 A few ideas for you from my family's favorites: Paddle the Nulhegan River, from Nulhegan Pond to Wenlock Station (camp nearby at Brighton State Park); paddle on Lake Memphremagog (there's camping available at a town park near Newport, I forget the name of the park...), paddle the Dead Creek - Metcalf Island loop in the Missisquoi National Wildlife Refuge; camp or day paddle at Green River Reservoir (small but lovely), paddle a section of the Connecticut River Paddlers Trail (perhaps the least known and least appreciated of our resources); put in on the Vermont side of Lake Champlain (at Basin Harbor, Kingsland Bay or Otter Creek and cross to paddle under the Palisades on the New York side; visit the Lake Champlain Maritime Museum (Crown Point and Fort Ticonderoga are also of interest to history buffs)... That's a few ideas mostly for Vermont. Perhaps someone will chime in for Adirondack possiblities.